I’ll let you into a secret: I’m not that keen on Ancient Greek architecture. It’s amazing because it’s so old, and impressive because it’s so grand (and I do have a soft spot for classical aqueducts), but all those columns and temples and plinths and semi-naked warriors and gods on top of pillars don’t do much for me. Byzantine, now that’s another thing entirely. I could happily have lived among those beautiful Byzantine churches, castles, lanes and palaces. Modern, in comparison to the “Ancient” stuff, the Byzantine empire first started moving into the Peloponnese in the 4th century AD and wasn’t entirely ousted from the region until the Turk/Ottoman occupation in 1460. 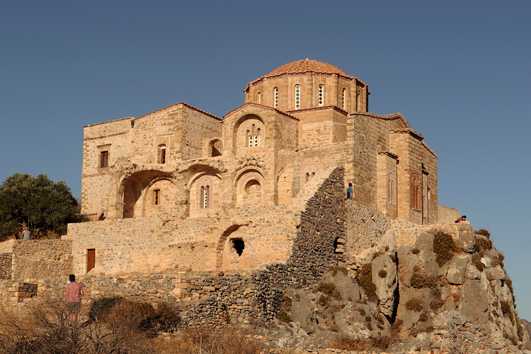 The Byzantine Church of Agia Sofia at Monemvasia. Just so gorgeous. And the equally fabulous Agia Sofia church and monastery at Mystras. Saint Sofia, who died in AD 137, had three daughters, who she named Faith, Hope and Charity. Under the reign of the Roman emperor Hadrian, not a Christian in any sense of the word, guards took Sofia's daughters one by one, from the oldest to the youngest, and tortured them to death, to get Sofia to renounce her faith in Christ. She did not, instead burying her three girls, before dying herself. Another admission: I find the term “Byzantine” confusing. Maybe because it is an artificial construct of historians. The “Byzantine” empire is actually more accurately the eastern half of the Roman Empire, and its capital was actually Constantinople by then, not Byzantium. So when people talk about the “Byzantine” empire, they are actually talking about part of the “Roman” empire, after the emperors got converted to Christianity. Nothing to do with Byzantium really. Part of the confusion is that ironically this Eastern Roman Empire (what is now Greece, Turkey etc) survived far longer than the original Rome-based empire did. The last emperor of Rome was executed by barbarians in AD476. Anyway, the Byzantine cities in the Peloponnese are simply lovely. We visited two - Monemvasia and Mystras - and both are glorious, perched on ridiculously steep hillsides (for protection from Franks and Turks and others), with a walled fortress area on the top, and then (also walled) layers of houses, churches and alleyways below. Looking at Mystras from below. The fortress (at the top) and upper town below that. The nobles lived just below the fortress, where they were safer from attack, and ordinary people lived in the lower town, which was also walled. The peasants/farmers lived outside the city walls, where they weren't safe at all, but came inside in times of danger. Monemvasia has the added frisson of being tucked into a large rock (think Gibraltar), so when you look at it from the land side you wouldn’t even know there was a town there at all. While Mystras is purely an archeological site, albeit a fabulous one with several complete buildings, Monemvasia’s Lower Town is still inhabited. This has the advantage that you can sit drinking Greek red wine in a bar in a little street looking at the sea, and imagine yourself back in the 14th century. The guide book mentions “an enormous dollop of romance” for “couples wandering hand-in hand down the cobbled lanes”. Cynical unromantic old-hand travellers (like Geoff) found it a bit kitsch and touristy, but I secretly rather liked it, particularly that its tiny steep lanes make it impossible to get cars in. The (romantic?) young couples were having a hard time getting their pushchairs up the main street, let alone anything bigger. We spent a happy afternoon/evening wandering around the Lower Town and sitting in cafes. Then the following morning - a Sunday - we headed up the rock, along a tiny, steep alleyway, to explore the castle and the Upper Town. We were slightly dismayed at the number of other visitors going up the path (did we have to go at the same time as a large Greek package tour?) until we realised we had hit upon the saint's day of the newly-renovated Church of Agia Sofia - September 17. The people greeting each other on the way up the hill were locals going up for the inaugural saint’s day service. The large Byzantine church, one of 27 (27!) places of worship in the relatively small town, was built in 1149 and has an impressive dome and (apparently, we couldn’t get in!) fragments of 13th century frescos inside. It is built on the edge of a cliff with amazing views of the bay, and for the saint’s day was absolutely packed with worshippers. They crowded the doorway, watching the priest (Greek priests are so impressive, with their untrimmed beards and wide-sleeved cassocks, their robes and, often, their black chimney-pot hats). Those who couldn’t get inside spilled out of the door, some chatting on the benches outside, others joining in the service through the window, chanting the responses, kneeling and standing, and crossing themselves at the relevant moments etc. The sun shone and it was magical. And we even saw a tortoise. A real live wild one. Gerald Durrell eat your heart out!